Does it bother anyone else that Snack Pack puddings aren’t refrigerated in the grocery store? 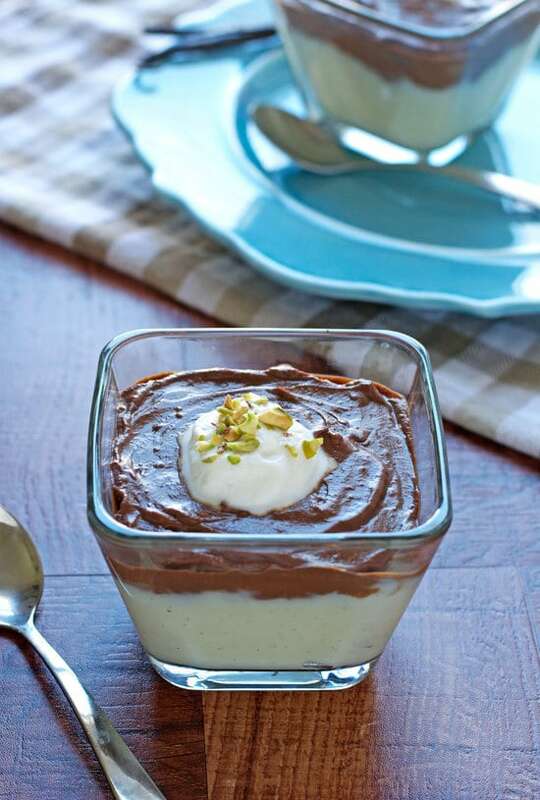 Let’s keep it cool with Double Decker Dark Chocolate Vanilla Bean Pudding instead. Pudding and I have a long, illustrious love affair. It dates back to an innocent time when I didn’t care (or notice) that Snack Packs weren’t refrigerated, and my greatest envy was my best playmate Brittany’s impressive collection of My Little Ponies. When I brought the disparity of our pony menageries up to my mom, she explained that it was because Brittany’s dad was a plastic surgeon. I assumed that this meant he manufactured My Little Ponies. I also like to think that at this point in our conversation my mom handed me a chocolate Snack Pack, but I can’t be certain. Like Wednesday’s outrageous Raspberry Chipotle Bacon Grilled Cheese (seriously please read this recipe! I’m obsessed, and it breaks my heart that my site went down the day I posted it), Double Decker Dark Chocolate Vanilla Bean Pudding falls into the category of recipes that energize me the most: grown up twists on childhood favorites. (See also: Brown Butter Churro Crispy Treats; Skinny Greek Mac and Cheese; Chocolate Soft Pretzels with White Chocolate Chips.) My love of pudding began in childhood, and I still crave it at least once a week. Making pudding from scratch requires little beyond a bowl, a whisk, and elbow grease. 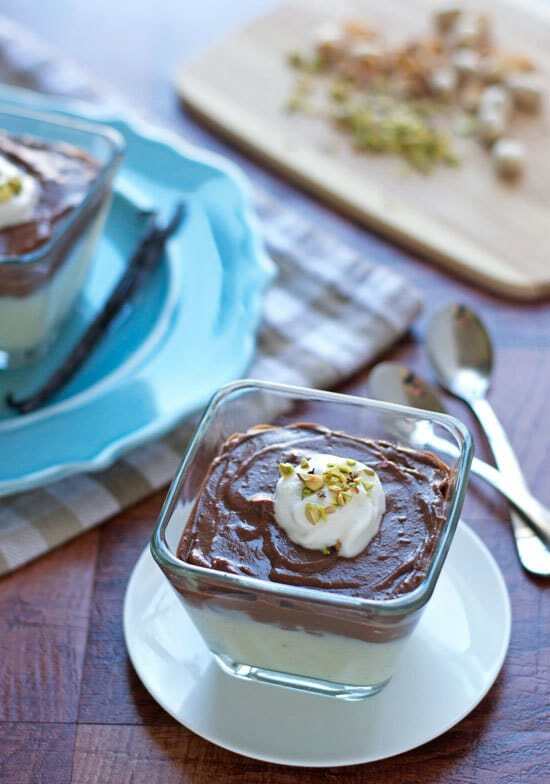 Today’s Double Decker Dark Chocolate Vanilla Bean Pudding (despite its heinously long name) is low fuss, reasonably healthy, and tastes completely decadent. The recipe uses an egg to thicken the milk instead of heavy cream, and espresso to intensify the flavor. Rather than making two separate pudding recipes, we simply make a vanilla pudding base, save a little at the end, then melt in heaps of dreamy dark chocolate. Voila! Velvety rich dark chocolate pudding, for a fraction of the effort and guilt. If you don’t have vanilla beans, you can easily substitute vanilla extract. I actually buy mine online here for a steal of a deal. Use the extras to make homemade vanilla extract (cheap booze + vanilla beans + time = amazing vanilla extract), or pop one into a jar of sugar or salt and enjoy the vanilla magic it creates. 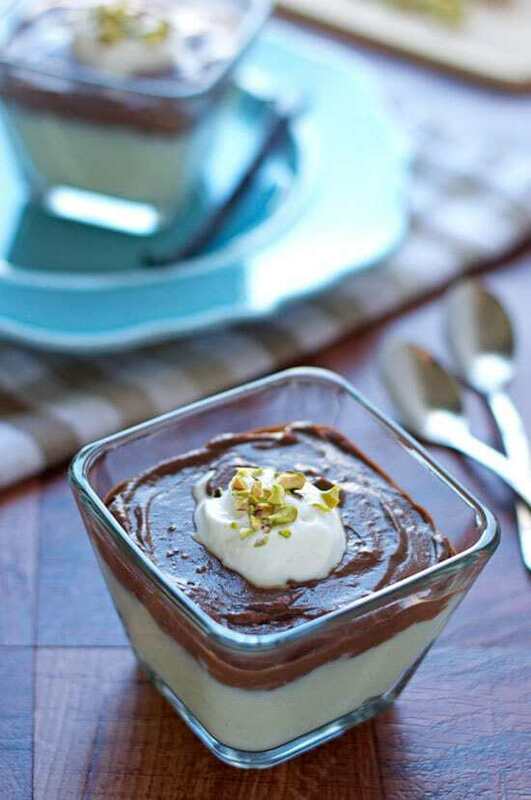 Final touch to our Double Decker Dark Chocolate Pudding: a flourish of pistachios and whipped cream. Totally optional. But kind of not. I’m so excited to be sharing this lightened-up twist on one of my childhood favorites with a wonderful woman who just had a beautiful baby of her own, Katie of Katie’s Cucina. I first discovered Katie’s blog when THIS stuffed French toast entered my life/Pinterest feed, and I have loved it (and her!) ever since. I’m honored to be guest posting for Katie today, while she and Ryder enjoy a little extra snuggle time. Katie, I wish you much love during this special time with Ryder (specifically THOSE CHEEKS) and four hours of consecutive sleep. Ryder, I wish you an entire herd of whatever the boy equivalent of My Little Ponies is and the fearless abandonment of eating unrefrigerated pudding without hesitation. To all, I wish you bottomless bowls of velvety Double Decker Dark Chocolate Vanilla Bean Pudding. Dig in! Velvety rich dark chocolate pudding layered atop vanilla bean pudding. A healthy pudding recipe that is the best of both worlds! In a medium saucepan, bring 2 1/4 cups of the milk to a boil. Meanwhile, in a large heat-proof bowl, combine sugar, cornstarch, and salt. Scrape vanilla bean seeds into the sugar mixture. Place the empty vanilla pod into the saucepan with the heating milk. (If you’re replacing the vanilla bean with extract, do not add it yet.) Very gradually, whisk the remaining 3/4 cup milk into the sugar-cornstarch mixture. Add the milk a little at a time and stir constantly so that lumps do not form. Whisk in the egg. Once the milk has boiled, slowly add it to egg-mixture a little bit at a time, stirring constantly (using a ladle can be helpful). Be sure to work gradually so that the egg does not scramble. Once all of the heated milk had been added, pour all of the mixture back into the saucepan. Stir constantly with a rubber spatula or wooden spoon and bring the mixture to a simmer (at this point, do not let it boil.) Simmer for 1 minute, stirring the whole time. If using vanilla extract, stir it in now. Pour all of the vanilla pudding mixture through the sieve into the bowl or measuring cup (this ensure the pudding will be very smooth). Return 1/3 of the strained mixture to the saucepan (this will become the chocolate pudding). Cover the remaining 2/3 with plastic wrap so that the plastic touches the surface and refrigerate until fully set, about 2 hours. To the remaining pudding on the stove, add the chopped chocolate and espresso powder, stirring until the chocolate melts. Pour the chocolate mixture into a separate bowl, cover with plastic wrap so that the plastic touches the surface and refrigerate until fully set, about 2 hours. To serve: Spoon the vanilla pudding into the bottom of individual serving dishes. Top with chocolate pudding. Serve sprinkled with nuts and dollop with whipped cream. Yay for working blogs. I too posted a recipe I was pumped about…only to be down for 24 + hours…worst ever! I wish I had this pudding to ease the pain. The hubby is obsessed with pudding, it’s actually a bit ridiculous. But, I am always the worst wife and just buy him the packs (totally weird they aren’t refrigerated!) so now it looks like I can up my pudding game! Pinned! Such a bummer about your site too! I think some chocolate indulgence is definitely in order. And I can’t lie, I do occasionally go for the Jell-O dark chocolate pudding cups–somehow I justified because those are in the refrigerated section, haha. Thanks for sharing this awesome recipe. And I didn’t know you could actually make your own vanilla extract- learning every day. Love how this recipe combines dark chocolate with vanilla bean- my all time fav! Must pin this one. WHAT?! My little ponies are in the museum?????? Oh my. I DO feel old, lol. Dude. Ever since i made the trifle lately with homemade pudding I am obsessed!! Want!! Omg. This pudding is everything I want in life!!!! Double decker… you’re so smart! 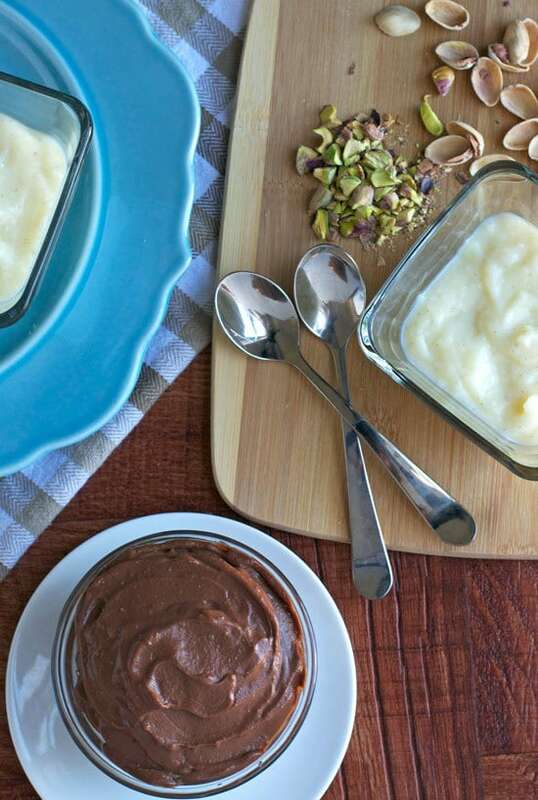 Yum – yup am all up for a bowl or 2 of this luxurious 10-ingredient pudding! How about three??? Thanks Shashi!! Vanilla and chocolate…this is double happiness!! It looks super, Erin. Pink puffy heart <---Best pudding description words ever! I think this weekend calls for that grilled cheese followed by this pudding for dessert. Yes yes. This is pudding perfection, will be making this next week-end for a get together, never made pudding before but this looks amazing! Girl! Yes! It totally has always bothered me that the pudding was not refrigerated…I always think ‘what is in there to make it not need refrigerating?’ This pudding looks absolutely yummy! You know if it has double decker and chocolate in the title I am ALL in. You know, the whole non-refrigeration of snack packs HAS always bugged me!! Like, why is Jell-O pudding refrigerated but Snack Packs aren’t? So weird. I would much rather make my own! plus then I get to eat the volume of five snack packs and call it one. Muahahaha. This is so good! Really tempting and indulgent! I bet it tasted divine! It TOTALLY bothers me that snack packs aren’t refrigerated!!! I mean … what’s in there?? Blech! I won’t let my kids eat them! This pudding sounds like the perfect match for your kiddos Gretchen! I’m all about the best of both worlds. Pudding was an absolute favorite of mine as a child, though nothing can compare to having homemade instead of those junk-laden storebought packets yuk!! Your version looks truly delicious and it has made me crave pudding like crazy now ahhhh I need this! I love those little square dishes! Where did you find them? This post reminds me that I need to eat more pudding, because, dang, this recipe looks good. Also, I kind of want to go to the store and buy a My Little Pony. I wonder if they still smell like strawberries? Pinning. I FORGOT about the strawberry ones, hahahahahaha. What a great memory! Hahaha I hate it when I post something and then the site crashes. I feel your pain Erin! Luckily I was one of the lucky ones that did see your life-changing grilled cheese recipe. That reminds me I totally have to make that soon. And now you’re totally talking my language with snack packs! So good! Sweet perfection Erin! This pudding is TO DIE FOR!